Hi guys, I'm now nearly 6 months into my recovery. I had a FFA soccer scholarship and things were looking good until I injured myself on the 2nd day of a week long National tournament. It wasn't known at the time the extent of the injury ( just some swelling and discomfort) but two weeks later I was playing in a game and the injured knee just gave way from under me. I decided to get an MRI and it showed a torn ACL completely off the bone. 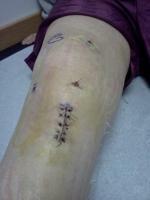 I had a hamstring graft in Nov 2011 and now after 6 months I'm starting to dream about playing again. After reading this site and the amount of people that came back too quickly and re-tore their ACL means its more obvious than ever that I should not rush back. I don't plan to pay again until 11-12 months after the Operation. At present my knee is good, no pain, no discomfort. I attend physio twice a week, a hydro pool once per week and in-between do my daily exercises. I also jog 3k once a week. I'm now at the stage of S-bends and some light sprints. So basically I;m where I should be at this stage, no further ahead but not behind either. The worse thing about being out with this kind of injury is that the phone stops ringing, the coach has forgot all about you, the scholarship doesn't get renewed and the soccer organization stops all communication plus your team mates start to lose touch. This is the down side because you are doing your very best to get back but you know your on your own, the family help all they can but you miss the dressing room and the sound and support of the coaches. That's why I have a lot of respect for the people who have gone through the whole process and came out at the end and played at the same level or even bettered themselves. My plan is to do my full recovery and stay very fit while doing so, then when I do appear on the training ground I don't need to worry about cardio or fitness and just concentrate on my soccer game. Prove to myself that I only had a year out (holiday!) and that I'm back playing like my old self again, that's my dream!